The 2018 Monster Energy NASCAR Cup season is simply around the corner. And after enjoying Martin Truex Jr. complete a dominant season by winning his first Cup Series title, fans cannot wait for the green flag to drop on a new season. 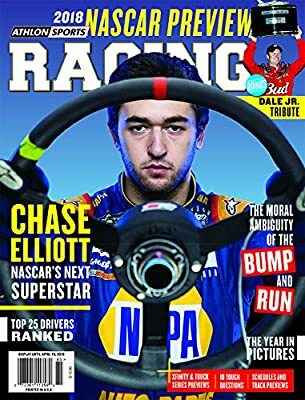 The 16th edition of Athlon Sports Racing arrives in the nick of time to provide the preseason analysis and predictions yearned for by race fans from Sonoma to Daytona and all over between. We take a couple of laps around the track, asking "10 Tough Concerns" and providing the politically incorrect answers - exploring hot subjects like Chevrolet's brand-new Camaro style, Year 2 of the Monster Energy sponsorship, Chase Elliott's pursuit of victory and more. In this year's edition, Athlon gets individual with some of the sport's most engaging figures. Our unique Q&A with Elliott brings you the unfiltered viewpoints of the beneficiary apparent to Dale Earnhardt Jr. as NASCAR's A lot of Popular Driver. We also bid Junior a fond goodbye with informative comments from his peers and admirers on the legacy that Earnhardt leaves as he transitions from the track to the broadcast cubicle. Mentioning Junior, he is however one of many of NASCAR's high-profile drivers to leave the sport in the in 2015 - however there is a gifted selection of children prepared and able to fill the void. We discuss this brand-new era of NASCAR in our function story, "Altering of the Guard." As always, Athlon Sports takes you inside the garage with confidential, extremely opinionated quotes from competing head wrenches, crewmen and navigator. Every track is previewed thoroughly, as are the top 25 drivers and the best of the rest racing for the checkers. There's also a rundown of the Truck Series and XFINITY Series, both of which are populated by racing's future stars. Athlon Sports Racing is the most complete preview offered today. Order your copy now.